Landing in the heat of Nashville and convening at our beautiful digs, The Hermitage Hotel, we quickly plied our concierge with questions on the best boot store, where to get the true Nashville Hot Chicken, and what honky-tonks were not to be missed. The Hermitage is a genteel, old world hotel, where staff members greet you with Southern charm and a welcoming smile, and you’re enticed to sink into a comfortable chair in its welcoming lobby or to belly up to the Oak Bar for a classic bourbon cocktail. After dancing in your boots all night, you’ll find a wonderful treat waiting at your bedside, as well as much needed bottles of water. The beds were heavenly to fall into! What were the highlights of our trip, and what should you do with four days in Nashville? Make sure you see a show either at the Ryman Auditorium or The Grand Ole Opry: That first evening, we had tickets to the Ryman, which had housed the original Grand Ole Opry from 1943 to 1974, during some of the most formative years of country music. We were going to be treated to some of the old and some of the new in the country world. The Gatlin Brothers were the guest hosts for Opry Country Classics. The show was inspirational, featuring Ashley Campbell, Glen’s daughter, Mo Pitney, The Gatlin Brothers, and Lee Greenwood of “God Bless the USA” fame. What struck me most was the pure delight in Larry Gatlin’s face as he watched and sang along to the guest artists’ performances. 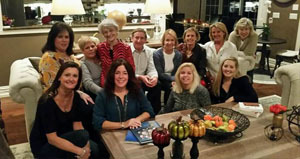 They were one big joyful family, and they were patriotic and faith filled. Visit as many honky-tonks on lower Broadway as you can! You don’t have to drink yourself silly, as there is no cover and no minimum drink requirement. Just pop in and enjoy the amazing talent that is present in each bar. Some of our favorite spots were Roberts Western World, Tootsies (rooftop is quite the party), Swinging Door, and Full Moon Cafe. Upon entering Roberts, immediately the mood overtook me. The amazing music coming from the band on the ramshackle stage was enveloping the crowd. We found a spot near the back and ordered a round of Chasers (the local brew) as well as some fried bologna sandwiches. I would not be caught eating this in NJ, but somehow the bologna, and the white bread drenched in butter was like a delicacy complimented by the ice cold beer! The talented artists, from young to not-so-young, had everyone singing along to their infectious performances. Visit the Country Music Hall of Fame and take the RCA Studio tour. This museum is not to be missed, even if you are not a country music fan. Walking along with an audio guide, you are treated to the history and “characters” of American Country Music, which spurs a walk down memory lane in your own life. Listening to the varied audio exhibits and viewing the displays, I was entranced at how intertwined country music has been in American culture. We spend two hours here, but I could have stayed longer. Highlights for me? The solid gold Elvis Cadillac and the Johnny Cash/Bob Dylan exhibit (who knew they were pals and collaborated often). The RCA tour is very interesting and gives you an opportunity to stand in the same space that Elvis, Patsy Cline, and host of other immortals stood while recording many classic songs. Don’t let the non-descript building fool you – it’s a powerful experience. Take the Pedal Tavern. 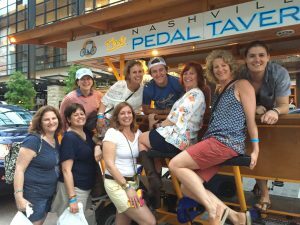 The Pedal Tavern is a cross between a bike ride and a bar crawl down Broadway. You are seated around a bar that has built-in cup holders, with pedals below to power the “vehicle”. The vehicle is a surrey of sorts, with a lovely awning, the bar, and most importantly, two good looking young guys who serve as the brakeman and the bartender. It’s BYOB and the bartender pours your beverages along the way. You’ll be treated to an array of country music blaring at a deafening pitch and will surely find yourself singing along at the top of your lungs. I saw the Pedal Tavern on my first day and thought, how ridiculous!!! Well, upon taking our own journey the next day, I thought, how fun!!! We stopped at 3 honky-tonks for about 15 minutes each and enjoyed a PT drink special. It was a great way to enjoy Broadway and I’d do it again. Have some Nashville Hot Chicken – Go to Hattie B’s and plan accordingly. Hattie B’s is uptown, in “the gulch”. The hours are 11am-11pm and you WILL WAIT in line to enjoy this amazing Nashville delicacy. There are other chicken shacks in town, such as Prince’s and 400 degrees. Make sure you get to one of them and give it a try. Try out some of the newer, hipper culinary and cocktail spots. We went to Patterson House for cocktails one day. Patterson House opens at 5pm and my advice is to get there early. It builds a line quickly because this “decadent” cocktail experience has become a staple in the Nashville experience. The interior is intimate, with lots of velvet, low lighting, crystal chandeliers, and cozy curved banquettes surrounding an exquisite bar. The cocktail menu is one of the best I have ever seen and the cocktails did not disappoint! Try dinner at Adele’s (a Jonathan Waxman venue), Rolf & Daughters, or 5TH & Taylor, all newer on the scene and excellent culinary venues. Finally, get to Pinewood Social one day for some bowling and a cocktail. This is a kitschy spot that gives you a break from the honky-tonk circuit. Buy some boots! I bought mine at French’s on 2nd and Broadway. They are service oriented and have a great inventory of western boots. You will find “booteries” all over town, so go in and enjoy the trying on experience. Then wear them out with shorts, a skirt, or some skinny jeans! There are a host of other things that I did not cover, such as biscuits at Loveless Cafe (which we did not get to), and having some comfort food in any of the honky-tonks. All-in-all, in Nashville, find yourself a relaxing hotel then just get out and play!